Happy February, everyone!!!!! I can't believe we're already into the second month - yikes! Time really is flying. I'm going to HAVE to make one! Wednesday. Well that means it's time to join the lovely crafters at Tami's Amis and Ginny's Yarn Along for an update on projects and books. This is the start of my second pair of socks (you can see the first pair here) and as I've had very little knitting time lately I have managed only a few rounds in the last week. I made the little sock project bag the other day to keep this sock in my bag, and I'm hoping that I might actually get to do a bit more work on it if I'm carrying it around with me. I'm also working on my Beekeeper's Quilt which I posted about yesterday so I won't repeat that again. The book was a recommendation which was also started last week, but when we were all ill I found I'd only get to read a few pages at a time, so despite being 26% through I don't feel like I'm "into" it yet. If I feel this way after a few more nights then I'll probably ditch it, so I'm interested to see what everyone else is enjoying at the moment. Well that's it from me. 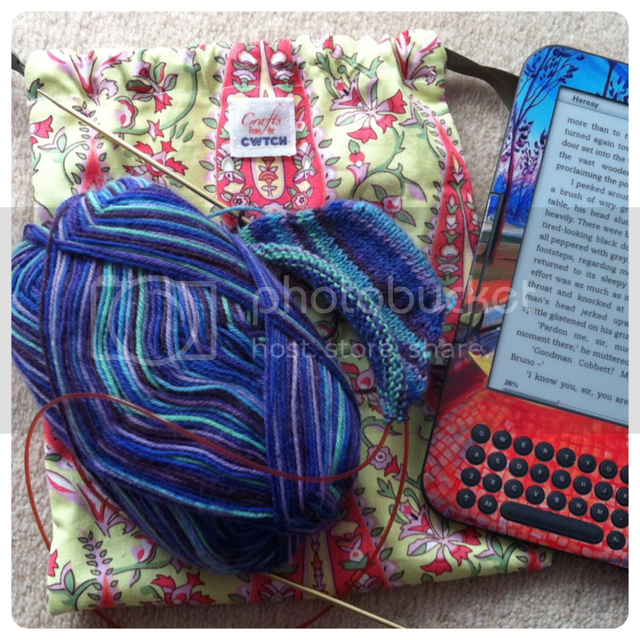 I am going to have a little look at the Month of Craft Photos project at Untangling Knots which I found via Stitched Together as it looks like fun. Love the bunnies. Just spotted the pompom tails. Cute. I do remember we used to say something about White rabbits on the first of the month when someone said 'pinch, punch....' not sure why these things start, but they do stick when your a kid. The sock looks really good so far! I wish I could get on board with toe-up but so far my experience has been less than stellar. :\ I'm not giving up on that technique, but, *sigh*. Such cute rabbits - thanks for the link. I love Kaffe's colorful quilts - I'll have to look into his yarn colors too. What fun little bunnies; they have so much character. Great sock yarn and project bag. What an interesting book you're reading. Have you read The Discovery of Witches? I loved that book. It's like an intellectual Twilight. Those rabbits are super cute- I look forward to seeing you make one, love the start of the sock- beautiful colour, and I really like your kindle cover- it's just given me an idea for my brothers birthday present!! I love the color of your new socks! Your sock looks great! I love the colors. Yay for more socks ;) Love the project bag you made, I really need a small sock bag to keep with me so I can make socks all the time. That sentence feels like it should end with a "muah hah hah"! Thanks for the link to the rabbit pattern. I'll be seeing all of my nieces and nephews for Easter and that might be just the thing to knit up for the occasion. BTW, that is such a pretty colorway for socks! loving the colourway of those socks, NICE! There must be hundreds out there as I've never seen that one. My LYS in Wgtn used to sell it and it is one of my faves because it is so snuggly and cuddly warm compared with lots of other brands. those bunnies are adorable. Loving the socks! Those bunnies are a must-make! Thanks for pointing it out. I am going to try some socks too, it's so cold here in Holland! Oh my gosh, they are so cute!!! I love your tag on your bag too - very cute! Hi Sarah, I love the colour of the sock wool! And I gave you the Versatile Blogger Award too!